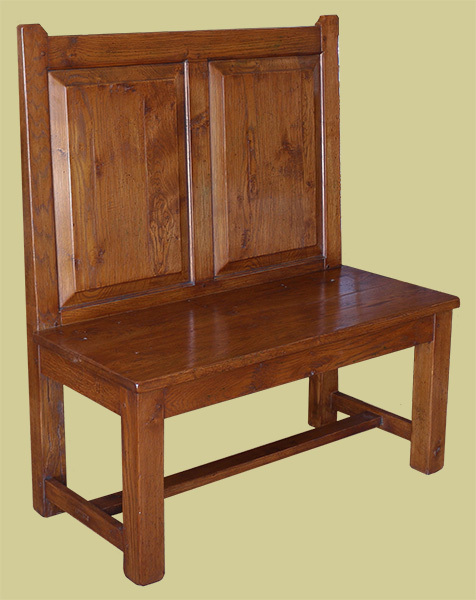 A simple straight back oak panelled hall settle, with fielded panels, plain legs, rails and stretchers. Ideal for a hall or lobby, where a raked back isn't so important for comfort, thus allowing the piece to sit right up against a wall and minimizing the space taken up. Being bespoke, it can be made to any workable length, depth and height. Note that the depth measurement given below, is taken at seat level and is overall, i.e. back of rear legs to front edge of seat. Could also be made as a box settle, with a lift up seat to reveal useful storage inside. Please ask us to quote for this option. Also see Simple raked back oak dining room settle, for a version which takes up a little more room, but is more suitable for longer periods of sitting.